MASTER PROBLEMS People and Society How to interact with a disabled person who uses a wheelchair? How to interact with a disabled person who uses a wheelchair? A British clergyman spent a day in a wheelchair pretending to be disabled. He reported that most people avoided him. 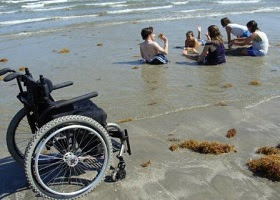 Do you find it difficult to be relaxed when you encounter someone in a wheelchair? Does embarrassment restrain your normal friendliness? Or perhaps you feel that disabled people prefer to be left to themselves. Whatever the reason, it must be admitted that many have a problem here. What can be done? So when you meet or visit a disabled person, there is no need to assume an awkward or unusual line of conversation. Be yourself. Talk as you would with any other friend or acquaintance. He does not want his disability to intrude into every conversation. He is interested in what is going on and enjoys exchanging news and thoughts with others. Many wheelchair people have limited opportunity to do that. The B.B.C. carried a radio series that emphasized the hurt that people unwittingly inflict upon the handicapped. Limited mobility often keeps wheelchair people indoors more than is necessary or good for morale. A fine way to help, which also provides relief for the regular care-companion, is to invite the disabled person to come out with you on a guided tour. This suggestion presupposes, of course, that your standard of care is acceptable. It calls for thought and understanding. Do you know how to handle the chair at street curbs, for example? Are you aware that it is dangerous and frightening to move the chair suddenly or unexpectedly? If travelling by car, do you know how to help your companion in and out? Are you sure the car seat will be suitably comfortable? Do you know where there are accessible toilets? What plans have you made to do more than just tour around? What is of interest in the area? Are descriptive brochures available? Forethought and planning will make the trip much more enjoyable for both of you. Sometimes the disabled person does not want to leave the house, or even his bed. He may be depressed. Why not try a little gentle persuasion if his care-companion agrees? Be careful, however, to discern the cause of his reluctance. Is it really due to depression? Or could it be fear of entrusting himself to you? If the latter, do not be offended. Likely that will change as he gains confidence in you. The fact remains, however, that in most cases it is good for wheelchair people to get out of doors regularly. Your warm offer to be his companion might just lift his low spirits. Another problem for the disabled person is to know when to assert his independence and when to seek or accept help. We all need help, yet no one likes to lose independence, to feel taken over. The disabled are especially sensitive about this. What independence they have is precious. So we need to offer help, not thrust it upon them. “Disabled folk and those caring for them are often very independent,” says Tom. But when you offer to help, take care not to sound too casual, as though you had nothing to do anyway. Your visit is very important. Not to be overlooked when thinking of the person in the wheelchair are the needs of the companion—often the spouse, sometimes a parent or other relative. So when next you meet someone in a wheelchair, think of the effort that went into getting him there, bathed, neatly groomed and dressed. A few warm words of encouragement to the companion would certainly be appreciated. And if an offer to relieve the friend for a few hours is possible, it may be very welcome. High on the list of things that bring satisfaction to all of us is worthwhile work. One of the problems of the disabled is that employers, too, often focus on the wheelchair. Naturally, they are concerned about competitive efficiency and extra insurance costs. Those who have accepted such difficulties, however, are frequently rewarded with conscientious and loyal service beyond normal. So talk with him on that basis. By giving, he will feel happier in receiving. Accept him as he is. Never refer to what he was or might have become, for he is not looking for pity. He wants to be positive, to be a doer and a giver to the extent possible. Encourage him! For fulfillment and satisfaction now, we must do with our might whatever our hands find to do—even in a wheelchair. That is the confident attitude of Tom, Phil, Derrick and many more. When you meet people like these, just see and warmly respond to the person. Don’t even see the wheelchair.